With the holidays right around the corner, have you already started thinking about the perfect gifts to buy for your family, friends, service workers and even yourself? Are you shopping on a budget? If so, consider the Coronado Locals Card which features around-town discounts galore! There are deals to match a variety of interests, and as people enjoy the discounts the Locals Card offers, they can smile knowing the donation made to Coronado Schools Foundation is directly helping local schools and students. 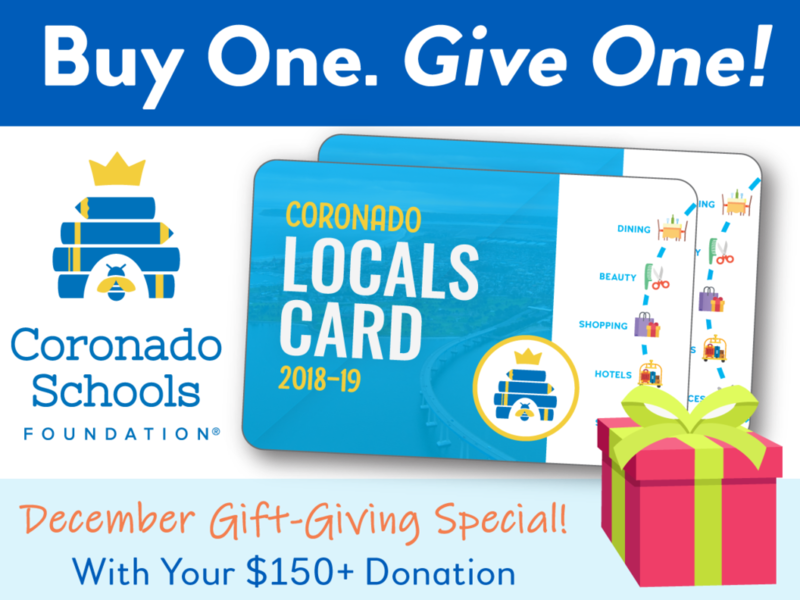 For the month of December, Coronado Schools Foundation is offering a Buy One Give One deal on the Locals Card with a donation of $150! Locals Card holders receive discounts at a multitude of local restaurants, health and beauty businesses, and hotels, and will additionally enjoy discounts off recreation activities, services, and purchases at participating stores. The discounts offered are made possible by local businesses that generously support Coronado Schools Foundation. In partnership with CSF, The Coronado Times is the place to go to see a full list of the local businesses which have partnered with CSF. Locals Cards may be acquired with an online donation, or in person at Coronado Hardware (140 Orange Ave.) and the Coronado Historical Association Museum (1100 Orange Ave). For years, local businesses have generously stepped up to donate to the Coronado Schools Foundation’s yearly Benefit Auction. (This year’s Havana Nights Benefit Auction was held on October 20th and returned $274,000 to local schools and students.) 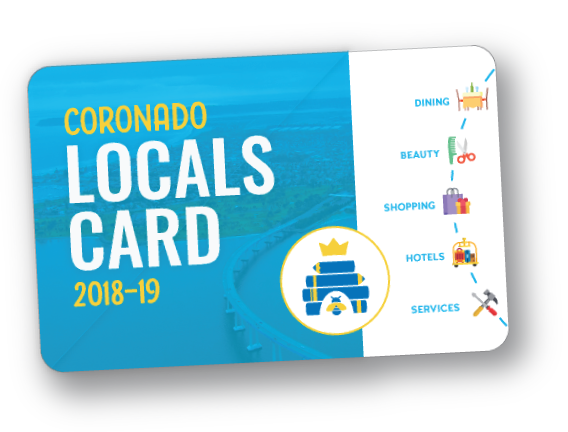 With grateful hearts for the local businesses that continue to support the Coronado Unified School District, CSF decided the best way to express their gratitude and appreciation was to launch a Locals Card. Many residents don’t know that Coronado Unified is funded in the lowest 7% of school districts across the state of California, simply due to its demographics. That equates to $1,500 per student or nearly $4.5 million across our small district. 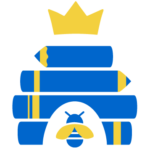 The majority of funds (83%) currently raised by CSF fund teachers whose positions educators and parents consider necessary for a quality education, but do not receive state funding. Many CUSD programs, such as science and computer labs, robotics, advanced computer programming, band and choir would not be possible without the annual CSF Site Program Grant. 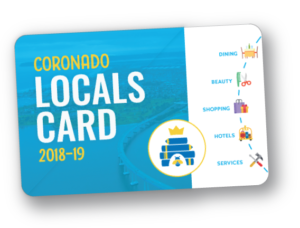 For questions, or if you are a business owner interested in learning more about the Locals Card program, please contact CSF Director of Development Leanne Anderson at landerson@coronadousd.net or 619.437.8059 ext.1.